This is the second part of a two-part recipe. See part 1 for the filling. It would’ve been nice if I had measured with a ruler before just going ahead and doing it, but sometimes it’s hard to think very far ahead. 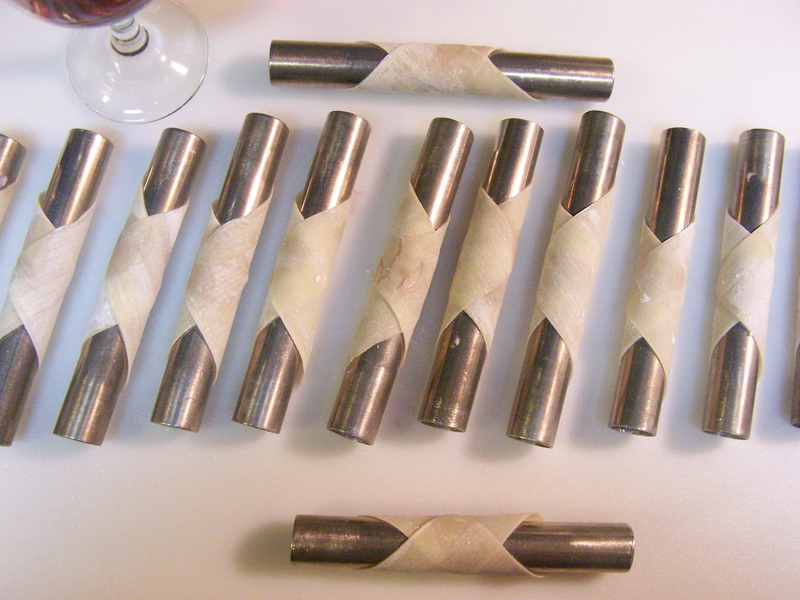 If needed, trim the wonton wrappers to “fit” your tubes. My wonton wrappers were about 3.5 inches by 3.5 inches. That was a little too big for the 3/4 inch tubes I was using. So I trimmed off about 3/8 inches from each side of the wonton wrapper, leaving about a 3 inch square of wonton wrapper. Follow the pictures below to roll the shells. 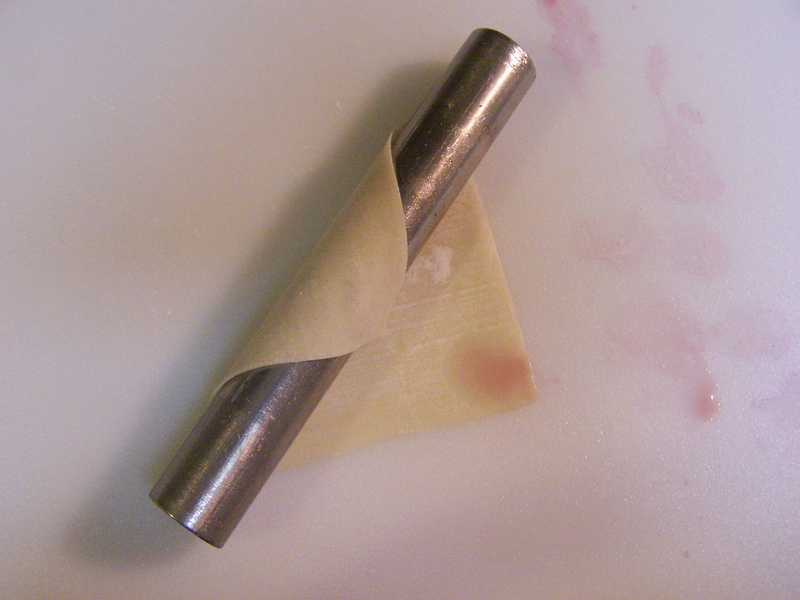 Basically you’ll just take the trimmed wonton wrapper, lay it on a cutting board, place the tube diagonally across the wrapper, wet one corner of the wrapper with some wine to help seal the shell together, roll the wonton around the tube starting from the non-wine corner. Press the wine corner down on the shell to help seal the shell together. 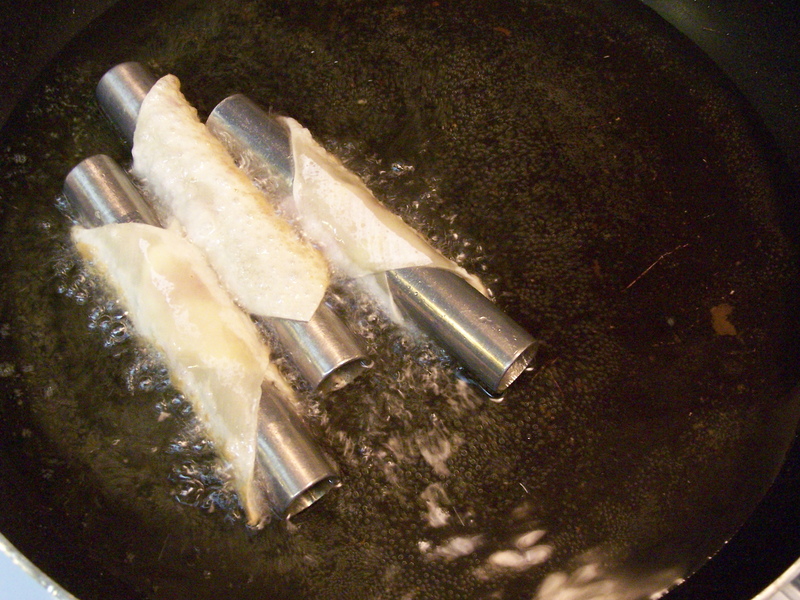 If you can sort of loosely roll the wonton around the tube, it will make removal easier after the shell is cooked. You’ll need about 1/2 inch to 3/4 inch of oil in a frying pan to fry the shells. If I remember the next time, I’ll use a 9 inch fry pan to save a little oil instead of the 12 inch in the pictures. As usual, keep the temperature of the oil low enough so the smoke detectors don’t go off, but hot enough to fry the dough. The first hardest part of frying the shells is avoiding burning yourself. Be careful. The shells will fry up in just about 30 seconds on one side. Then roll the shell over and fry the other side. You’ll know soon enough if you’ve over cooked them. 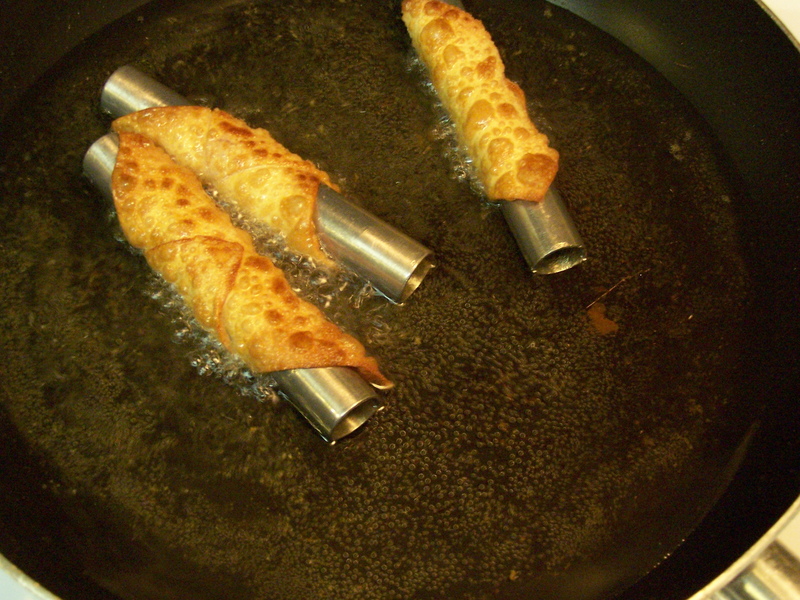 Carefully lift the tube out of the hot oil with a utensil that won’t burn or burn you. With my hollow tubes, a fork worked well. Place a tine in the tube and a tine over the tube and lift the handle of the fork until the tube is sort of loosely wedged on the fork. For solid tubes you’ll need some kind of tongs. Drain any dripping oil back into the pan. Place the hot tube and shell on some paper towels to cool and drain. Be quick. 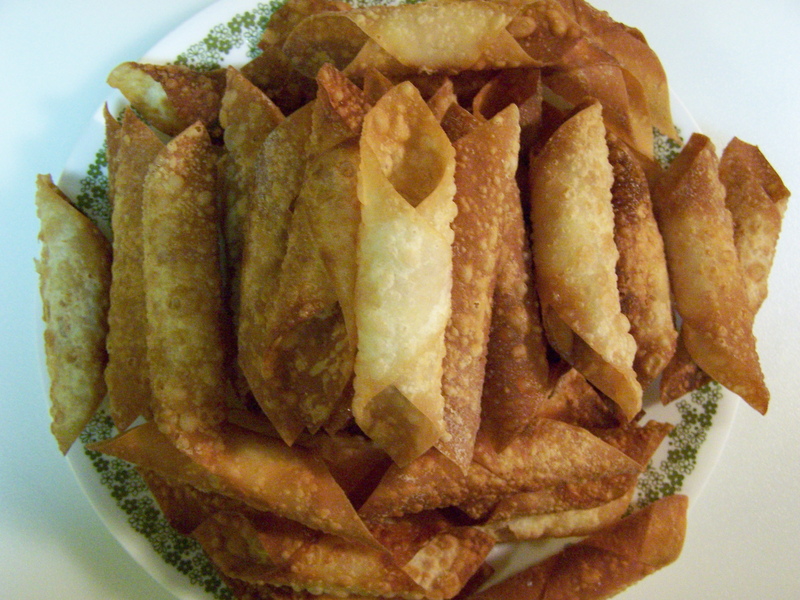 Four to six shells is about as many as you’ll be able to fry at a time. A small deep fryer may work just as well. I haven’t tried that approach. Once the tube and shells are cool enough to handle (this is going to be about 5 minutes or more), remove the shell from the tube by holding the shell in one hand and using the other hand to twist and pull the tube out of the shell. This is the second place in the recipe where you’re likely to get burned. The tubes retain heat for a long time. “But”, you say, “where do I get the tubes?” A long time ago I bought about 6 feet of 3/4 inch hollow aluminum tubing at my local hardware store. 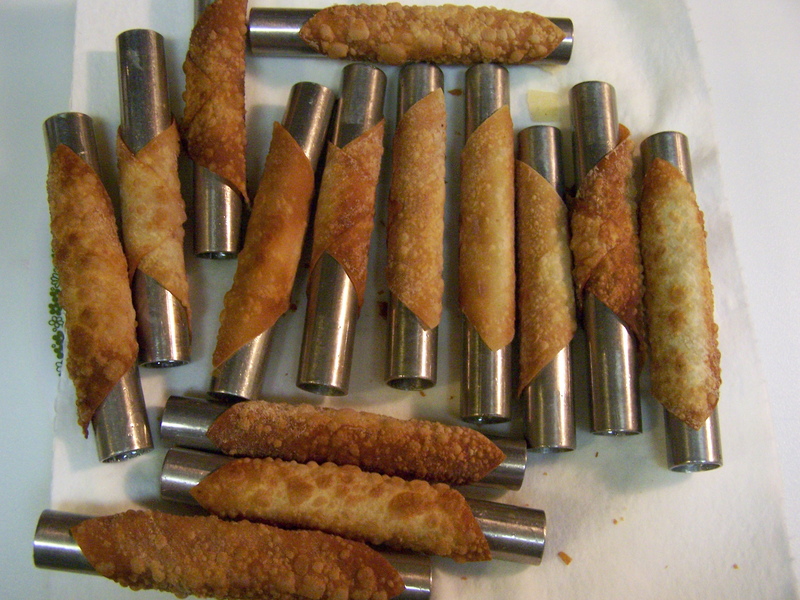 A little persuasion with a hack saw and a little edge trimming with some sandpaper, resulted in a bunch of 5 inch tubes for my cannoli forms. Although I’ve never tried this, you can substitute similar size wood dowel for the aluminum tubing and a wood saw for the hack saw. That will give you some wood forms to roll the dough around. From what I hear, that’s the way it was done in the old country. 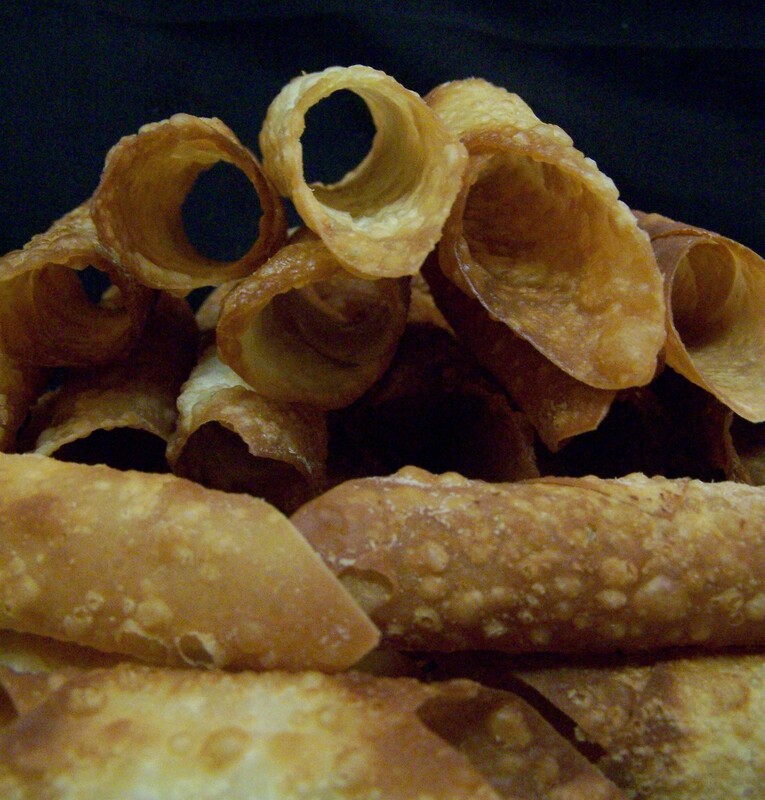 You can also buy cannoli forms/tubes. Try Amazon or your local cooking supply store. The cost varies widely, from about a $1 a tube to about $5 a tube. Usually they’re sold in sets of 4 tubes. I used canola oil to fry the shells. I think I picked up a little extra unwanted taste in the shells from the oil. Possibly I over heated the oil? At any rate, I’ve never had this problem with “vegetable” oil. Vegetable oil is most often plain old soy oil. Read the label. In the future, no more canola for cannoli. 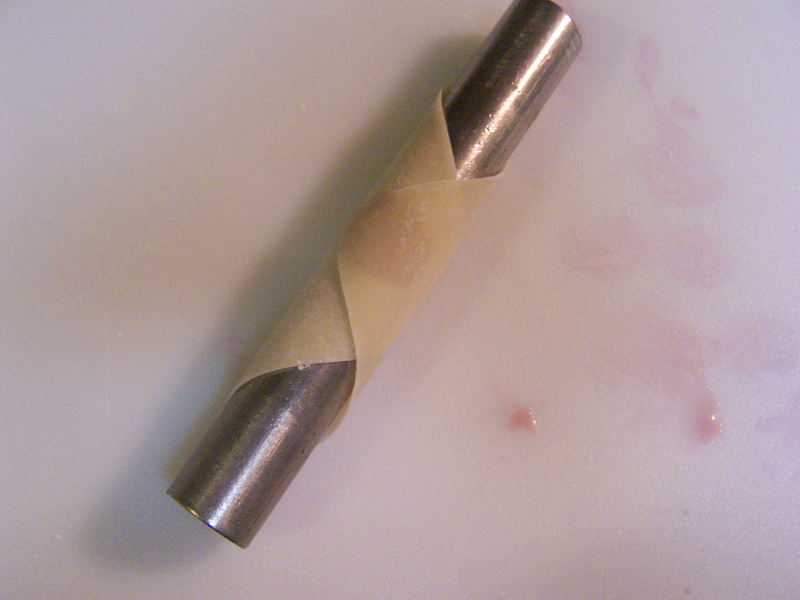 If you’d like to make your own cannoli dough, instead of using wonton wrappers, see the optional part 3. This entry was posted on 01/09/2011 at 09:33 and is filed under Recipes, Recipes, food, cooking and related items, Vegetarian. You can follow any responses to this entry through the RSS 2.0 feed. You can leave a response, or trackback from your own site. Great information; now I’m ready to make my cannolis! !